It was a sultry hot summer day in east Tennessee. You know, one of those days when the roar of the cicadas' music makes it hard to think. I was waiting for the Big Guy. Yep, I was at the airport. The 1972 martial arts instructor for the Navy Seals' Team One said that the Big Guy's, "studies on training for martial arts would easily exceed post-doctoral work. . . and he's mastered forms of fighting most of us have never heard of." I waited as the passengers deplaned. Which one was the former coach from the Olympic Training Center in Colorado Springs? Have you ever run your finger down a list of names inscribed on a Hall of Fame plaque? I guess it depends on who you are, but most folks have never had the privilege of personally meeting a champion, let alone training with one. The Big Guy not only trained with them, he was a champion himself. He tapped into the strength and conditioning secrets of the world's greatest fighters. On that winding drive through the forest to my mountaintop dojo, I urged the Big Guy to put these hidden training techniques into a book. But I had to wait. During that time, John Saylor put knowledge to knowledge, skill to skill, technique to technique, and questioned the greatest fighting minds on the planet. "Strength and Conditioning Secrets of the World's Greatest Fighters" book"
P. S. As a bonus, you'll learn how I developed a world-class grip. John asked me to tell you about it in the book. P. P. S. Don't forget, if you act now you'll also receive a 45-minute training interview I did with John on Audio CD - FREE! An additional $25.00 value - *Only while supplies last, so order now! To receive your Book and FREE Bonus Audio CD where John discloses even more secrets Order NOW on-line! Or call 800-491-7141 *Don’t forget, if you act now you get the book by John Saylor with the FREE Bonus Audio CD All for only $29.95 plus $7.00 S&H (Total Value $54.97). "John Saylor's book on strength and conditioning is the real deal. John was a world-class athlete in judo and competed on the highest level. 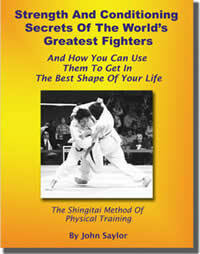 If you are a serious competitor or coach in any combative art, this book is a must read!" Mike Swain, 1980, 1984, 1988, 1992 Olympic Judo Team, 1987 World Champion, 1996 Olympic Coach . 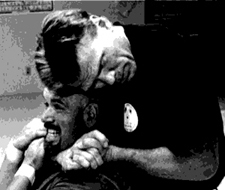 "John Saylor was a top-notch competitor, now a top-notch trainer of combat fighting. When John's not teaching, he is learning new techniques for combat and conditioning. He now shares his vast knowledge for all in this exciting book." Louie Simmons, Top 10 in Powerlifting from 1972-2002, National Powerlifting Champion, Owner of World's Strongest Gym: Westside Barbell Club. Columbus, OH. "For those of us who have known John Saylor over the past few decades and have witnessed his discipline and quest for knowledge, this is the book we've all been waiting for." "John Saylor is not only the best judo and jujitsu instructor I know, but he is the most knowledgeable man I know on the subject of physical conditioning. " "If you are interested in getting into and staying in great cardiovascular condition, maximizing your strength, increasing your speed and flexibility and preventing injuries, you must read this book... It is a treasure trove of knowledge... The Complete Training Package For Any Age!" "Every combat athlete needs the highest level of strength and conditioning. This book will be your road map to success."